Hoppe's No. 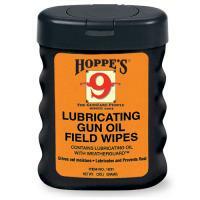 9's Lubricating Gun Oil Field Wipes are designed to go along for the ride wherever you take your firearms. Give your gun a good 'ol layer of added oil whenever necessary to prevent and resist the build-up of unwanted rust. Built to lubricate with a thin coat of oil, Hoppe's wipes also help repel moisture with the inclusion of Weatherguard in their trademark formula. Each tear and rip-proof towelette contains enough oil to accommodate maintenance of one to two rifles. Take the Field Wipes with you to the range, in the field or just use them in the shop. They're great for a quick wipe or a long prep session before putting firearms in storage till the next season.